Summer is here and I am happy. Really happy. While everyone around me is huffing and puffing in the intense summer heat, I am singing and skipping. I know it may sound weird, but you’ve got to remember that I grew up in these temperatures until I was well into my teenage years. So some of my best memories in life involve high temperature settings. Or as I remember them, pleasant temperature settings. July always gives me extra reason for celebration as July 1st is the official day that slavery was abolished in my home country Surinam in 1883. Now you should know that we Surinamese take our parties very serious. But no party, maybe apart from our birthdays, is more important to us than this one. The day that we get to celebrate our freedom. The event has the inspirational name Keti Koti, which means “The chains are broken” and it is the one day in the year that I won’t set foot in a kitchen. Unless it is to stuff my face with Suriname goodies. No work, only play (and of course food, and lots of it) for me on Keti Koti! Summer unmistakenly is Pitta season but this 1st of July was exceptionally hot. And as much as I love the sun and the wonderful energy it brings, too much of it can be draining. After being on the festival site for just an hour or so sweat was dripping from my dress and I desperately needed some cooling down. So I did what reportedly my mom did all the time while pregnant with me. I got myself a huge cold coconut and slurped out the cooling water like there wasn’t gonna be another Keti Koti for me to celebrate. God, that felt good! I could feel my body get lubricated and replenished almost instantly. 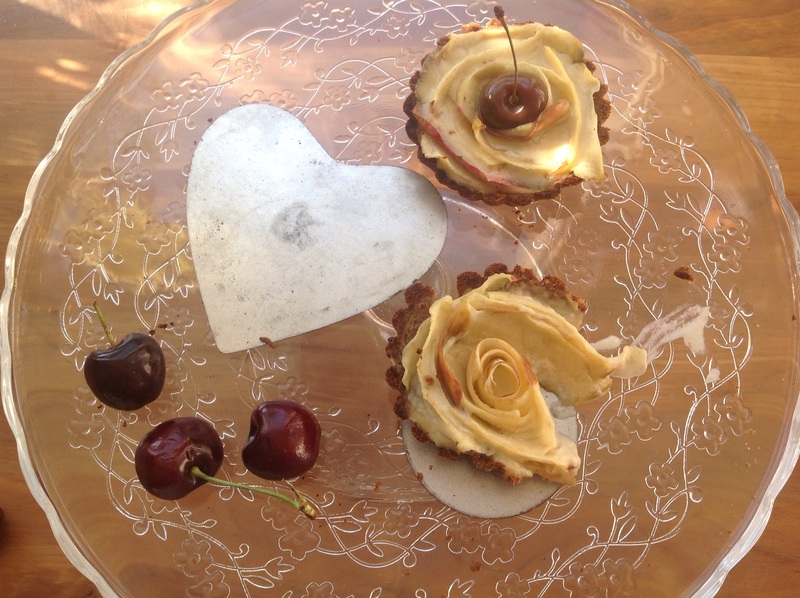 And so came the inspiration for these beautiful edible coconut roses to me. 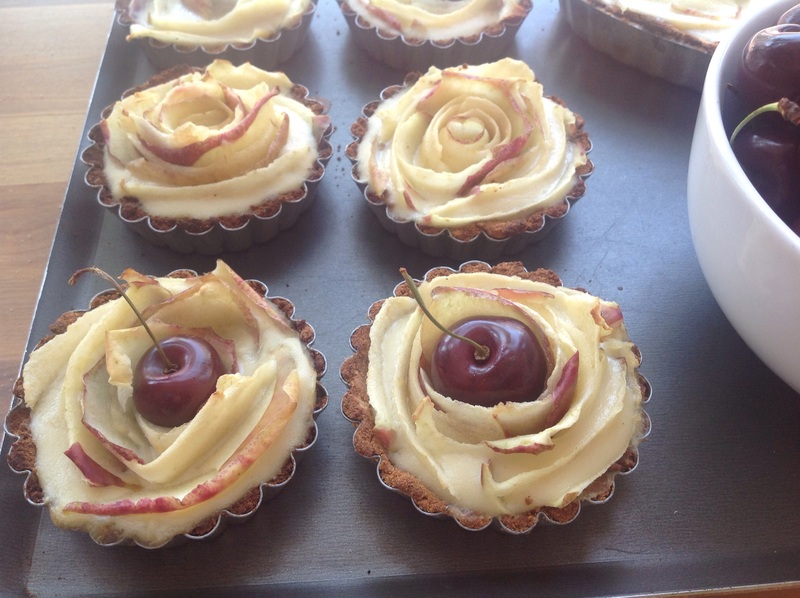 I had been eye balling apple rose tarts recipes that have been popping up all around the web for quite a while. They looked stunningly beautiful to me and I couldn’t wait to try my hand at my own version. This recipe is especially appropriate this time of the year since rose and coconut are two of the most cooling ingredients for Pitta. 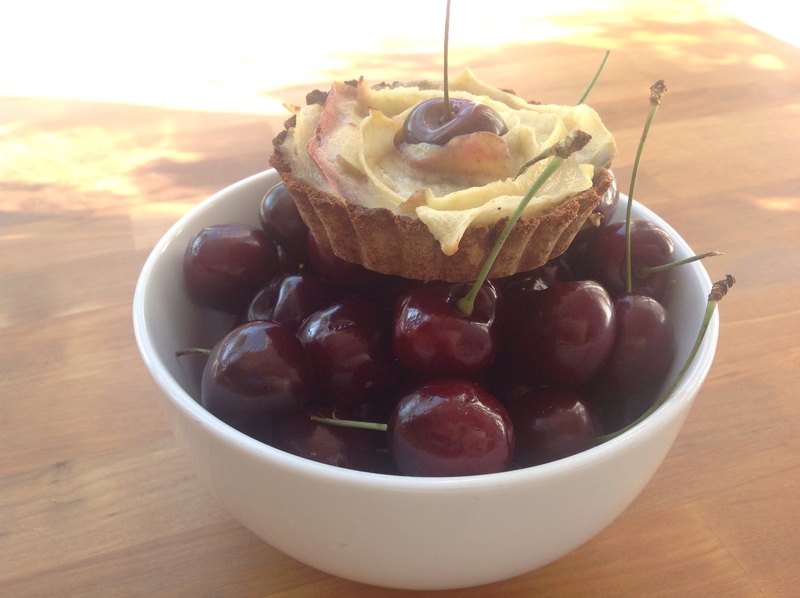 Instead of one big tart I opted for individual sized mini tarts and I topped mine with giant cherries. This apple tart presentation was made famous by the French chef Alain Passard of 3-starred Michelin restaurant L’Arperge in Paris. In this sweet Youtube film he explaines how he got the inspiration from his grandmothers flower garden. In turn I was inspired by my mother to make a cooling and much lighter tart by using coconut, both for the pastry as the custard filling. The result is a Surinamese summers day (read every day!) in one bite. Delicious, exotic and beautiful. Grease the tart molds with coconut oil and put them on an oven tray and put aside. Preheat your oven to 175 degrees C.
Mix all pastry ingredients in a food processor until you have a mixture that resembles wet sand. It will seem very loose and not as cohesive like you may be used to with other pastry doughs, but don’t worry about it. It will be just fine. Let it rest for about 5 minutes for the coconut flour to soak up all the other ingredients. Scoop about a big tablespoon of tart dough worth in the bottom of each tart mold and press it down with your fingers making sure it comes up evenly along the sides of the tart shell. If necessary add some more dough to get the pastry distrubited evenly along the sides and bottom of each shell. Now cut small pieces of parchment paper to fit into each tart shell. Cover the pastry with the parchment paper and fill with oven weights or dried rice or pulses. Bake in the middle of the oven for about 5 to 8 minutes until the sides of the pastry turns a nice golden brown. Remove from the oven and carefully remove the parchment paper including filling. Return the shells to the oven and brown for 2 more minutes so the bottom also colors. Don’t let them get too dark as they will go back into the oven once they are filled with custard and apples. Take shells out of the oven and let cool while you make the filling. For the filling on medium fire heat the coconut milk, cornstarch and maple syrup while constantly whisking until small bubbles start to form on the surface. Lower the heat to it’s lowest setting and slowly pour in the eggs while whisking. Let the custard set in about 8 to 10 minutes stirring it every once in awhile to prevent a skin from forming and to avoid lumpy custard. Make sure that your fire is not too hot so the eggs don’t start to scramble. You know that your custard is thick enough when it coats the back of a spoon. Take your custard of the heat and add in the vanilla, rose water and himalaya salt. Let cool a bit.Scoop about 1 tablespoon of custard in the tart molds filling it up about three thirds. Don’t over fill it as it will spill once you add the apple roses later. To make the apple roses cut the applesin quarters. Remove the core and peel different lengts of shards of the apples keeping the peel on with a vegetable peeler or, even better, on a Japanese mandoline. It doesn’t matter how long they are as long as they ar not too thick. You need to be able to fold them without snapping them so you want them as thin as possible. Roll up an apple ribbon to a very loose spiral. Take a second apple ribbon and wrap that around the first spiral. Keep on going until you have a rose to your liking. You can find a great tutorial on the making of apple roses in this great film by Buona pappa. In this film the apple slices are softened in the microwave, but if you slice them wafer thin on a mandoline in my experience that is not necessary. 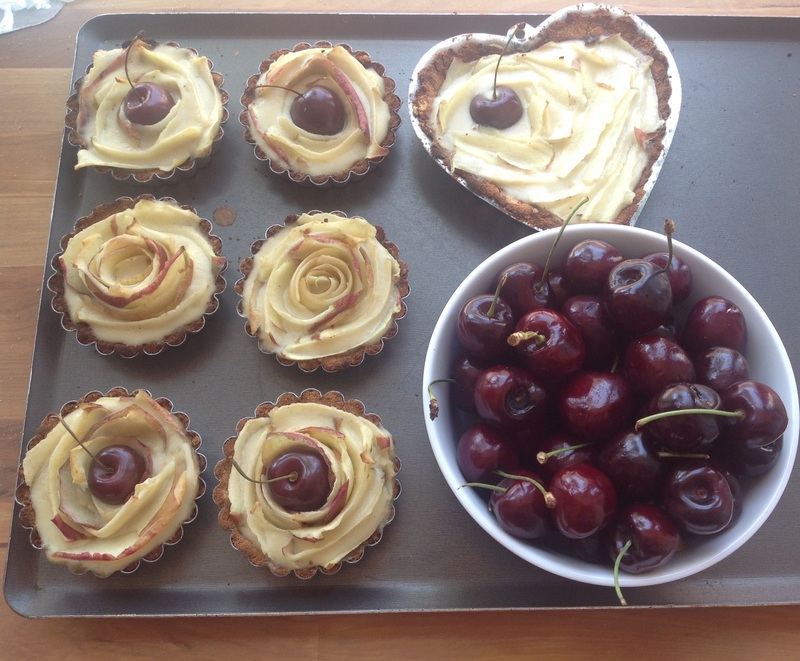 Gingerly place the apple rose in the custard in each tart and move on the make the next rose. 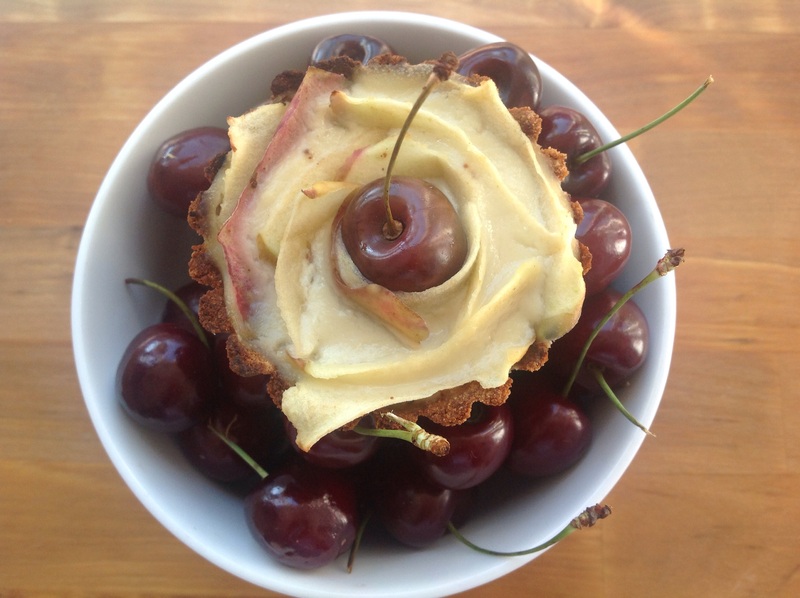 When all tarts are topped with an apple rose nestle a cherry in the center of your apple rose. Cover the sides of the tart crust with aluminium foil to prevent them from burning if you want. Return the filled tarts to the oven and bake for about 5 to 8 minutes until the edges of the apple rose petals start to colour nicely and the custard thickens a bit more. Take out of the oven and leave to cool for at least 10 minutes before removing the molds. In case you have any leftover custard you can serve this on the side. Vet je pievormpjes in met kokosvet en plaats ze op een ovenplaat. Verwarm je oven voor op 175 C.
Voor de piekorst doe je alle ingrediënten in een keukenmachine en pulseer je tot het deeg de consistentie van nat zand heeft. Dit deeg blijft kruimeliger dan je misschien gewend bent van andere piedeegsoorten. Je kunt het dus niet uitrollen. Maak je daar geen zorgen over. Het komt allemaal goed! Dat beloof ik. Schep een volle eetlepel van het kruimelige deeg in de pievormpjes en druk goed aan met je vingers en duim. Zorg dat het deeg gelijkmatig verdeeld is over de bodem en zijkanten van de vormpjes. Doe er zo nodig nog wat extra deeg bij om gaatjes in de korst te repareren en druk goed aan. Knip vierkantjes uit het bakpapier groot genoeg om in de pievormpjes te passen. Leg deze bovenop het korstdeeg en vul met keramische bonen, oude bonen of rijst. Plaats de ovenplaat in het midden van de oven en bak in 5 tot 8 minuten tot de randen van de pies goudbruin beginnen te kleuren. Verwijder voorzichtig het bakpapier en de vulling en bak nog 2 minuutjes in de oven om de bodem ook net goudbruin te krijgen. Bak ze niet te lang want ze gaan later weer met de custard en appelvulling de oven in. Haal uit de oven en laat een beetje afkoelen terwijl je de custardvulling maakt. Voor de vulling doe je de kokosmelk, ahornsiroop en maizena op middelhoog vuur in een klein pannetje en brengt het al goed kloppend net tegen de kook aan. Draai het vuur nu op de laagste stand en giet de geklopte eieren bij de warme kokosmelk. Klop heel goed om klontjes te voorkomen en laat de custard in 8 tot 10 minuten dik worden. Zorg ervoor dat je de custard op heel laag vuur laat indikken. Staat je vuur te hoog dan zullen je eieren te snel stollen en wordt je custard klonterig. De custard is klaar als het de achterkant van een lepel bedekt zonder eraf te lopen. Haal van het vuur en laat iets afkoelen. Schep ongeveer 1 eetlepel custard in de pievormpjes tot ze 3/4 vol zijn. Vul ze niet te vol omdat ze anders gaan overlopen wanneer je later de appelrozen erin doet. Snij je appels in vieren en verwijder het klokhuis. Laat de schil aan de appels. Snij nu met een dunschiller of, nog beter, op een Japanse mandoline flinterdunne plakjes van de appel. Draai een plakje appel in een losse spiraal en draai daar steeds een ander appelschijfje omheen tot je een roos naar je hart hebt. Je kunt hier een voorbeeld zien van hoe dat moet. In het filmpje maken ze de roosplakjes extra zacht in de magnetron maar als je ze heel dun hebt gesneden op de mandoline is dat niet nodig in mijn ervaring. Als je roos vol genoeg is plaats je ‘m voorzichtig in de custard. Ga zo door tot je alle pies hebt voorzien van een appelroos. Zet tot slot een kers in het hart van de appelrozen. Als je dat wilt kun je de randen van de piekorst met wat aluminiumfolie afdekken voor de pies in de oven nog 5 tot 8 minuten te bakken. Je wilt dat je appelbloemblaadjes net goudbruin beginnen te kleuren en dat je custard nog net wat dikker is geworden. Haal de ovenplaat uit de oven en laat de pies tenminste 10 minuten afkoelen alvorens ze uit de vompjes te halen. Als je custard over hebt kunt je dit apart bij de pies serveren.